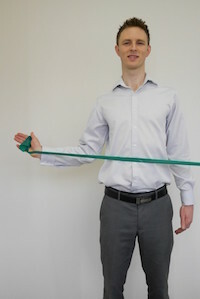 Start standing on terra band with arm at 45deg from hip and raise the arm until head height and hold before gently returning to starting position. 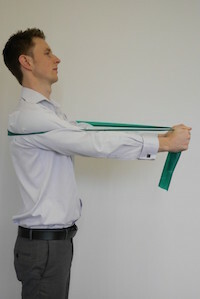 Start with elbow and shoulder bent to 90 deg with arm parallel to floor. 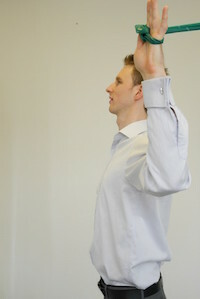 Rotate arm backwards so that forearm is perpendicular to the floor and hold before gently returning to starting position. 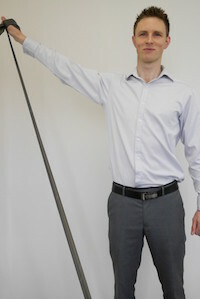 Start with elbow by your side and bent to 90 deg. 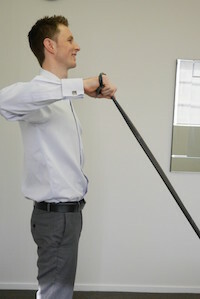 Turn arm out as far as comfortable and hold before gently returning to starting position. 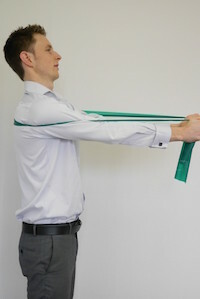 Start with the arm and shoulder bent to 90deg with lower arm perpendicular to the floor. 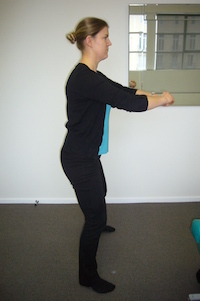 Now rotate the lower arm so that the arm is parallel with the floor and hold before gently returning to starting position. Start with arms stretched forwards. 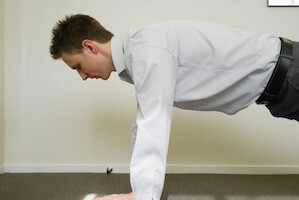 Push both arms forwards without bending the elbows so that the shoulder blades slide forward. Hold before gently returning to starting position. s above but using body weight not theraband. Ensure the elbows don’t bend. 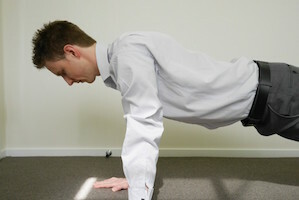 this may be performed with bent knees or on feet depending on strength levels. 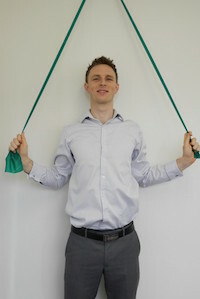 Starting with arms stretched forwards pull both arms back so hands are level with navel and hold before gently returning to starting position. 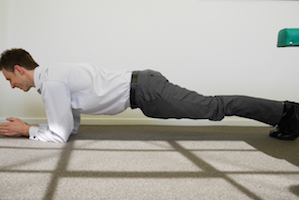 Start with arms parallel to the floor, elbows bent to 90 degrees. The hands should be level with the top of your head. 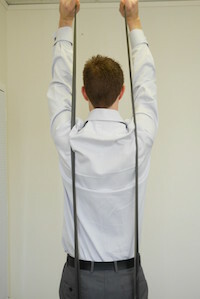 Pull the arms down so the elbows are tucked into your side and hold before gently returning to starting position. Start with elbow by your side and bent to more than 90 degrees. 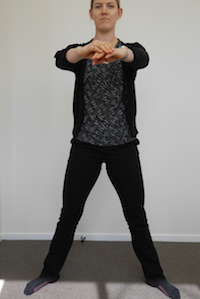 Now bend your elbow so your fist approximates your shoulder and hold before gently returning to starting position. Start with arms bent so that your hands are behind your head. 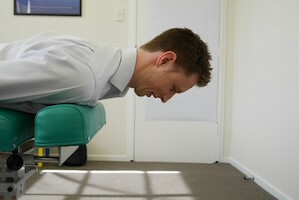 Now straighten your elbows up above your head and hold before gently returning to starting position. 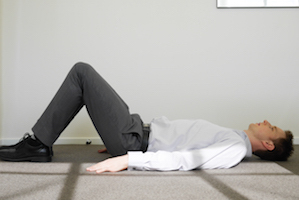 Lay face down with your head and neck hanging over the edge or your bed or couch. 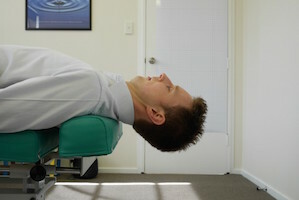 Now pull your head up towards the ceiling keeping the chin tucked and hold before gently returning to starting position. 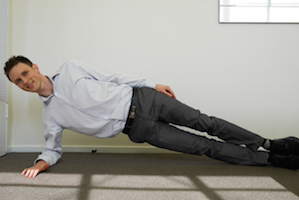 Lay face up with your head and neck hanging over the edge or your bed or couch. 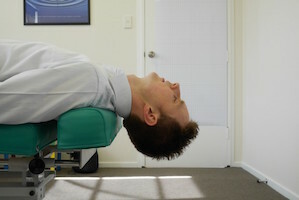 Now pull your head up towards the ceiling keeping the chin tucked and hold before gently returning to starting position. 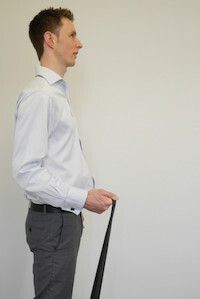 Stand on one leg, with the other leg at 30-45 degrees to the side. 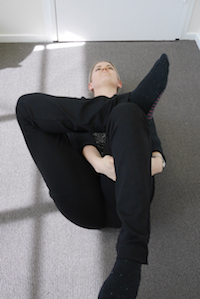 Bring the leg in towards the weight bearing leg and hold before gently returning to starting position. 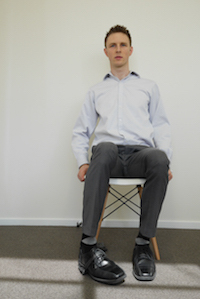 Standing with feet together, raise leg 30-45 degrees to side and hold before gently returning to starting position. Start with feet slightly more than shoulder width apart and toes slightly turned out. Now bend the knees and hips so the knee is at less than 90 degrees. 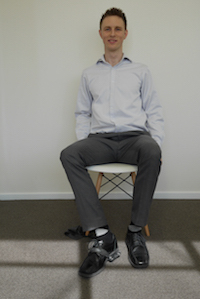 Ensure the knees don’t travel past the toes and no inward or outward buckling occurs. Start with feet further than shoulder width apart with toes turned out. 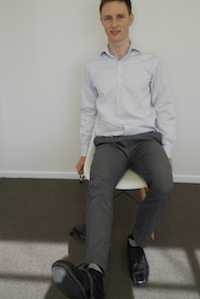 Now bend the knees to 90 degrees, ensuring that the knees follow the same path at the toes but don’t go past them. Hold before gently returning to starting position. Start seated with toe turned in. Now straighten the knee keeping the toe turned in and hold before gently returning to starting position. Start seated with toe turned out. Now straighten the knee keeping the toe turned in and hold before gently returning to starting position. 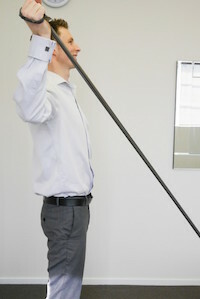 Place weight on the toes and elbows with the head in neutral. 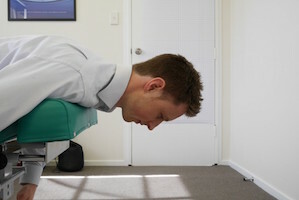 Ensure the back remains flat. 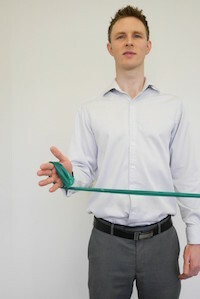 If arching of the lower back occurs with fatigue that is a good indication you have held for long enough. Rest and repeat. Stack feet and place weight on elbow and forearm. 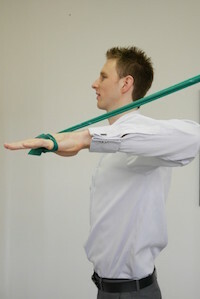 Ensure there is a straight line from ankle to hip to shoulder. 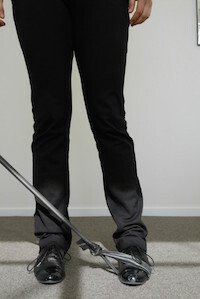 If the hips begin to sag with fatigue that is a good indication you have held for long enough. Rest and repeat. 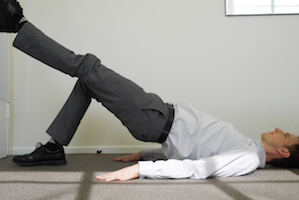 Start lying face up with knees bent and feet flat on the floor. 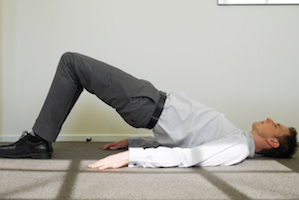 Push the pelvis up towards the ceiling. 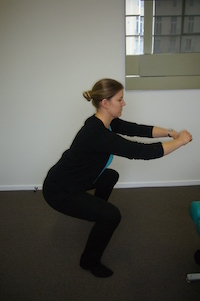 If your pelvis begins to sag with fatigue that is a good indication you have held for long enough. Rest and repeat. Once this is performed easily you are ready to add a leg raise. In position 2, raise the foot off the floor while keeping the thighs level. 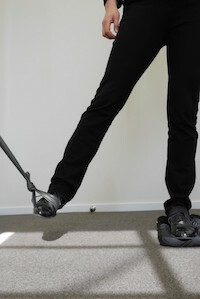 Return the foot to the floor before gently returning to starting position. In a corner with the arms wide, push your chest in towards the corner. Start with feet further than shoulder width apart. 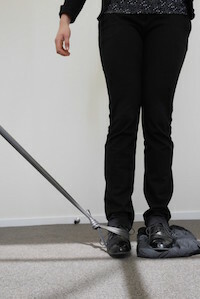 Now transfer your weight onto one leg with a bent knee stretching the other leg out to the side. Bend one knee so that heel approximates the buttock on the same side. 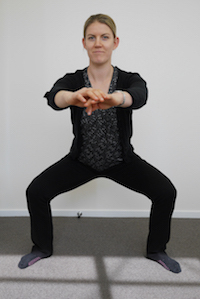 Ensure that the knees are kept level and the torso remains upright. Start on one knee. 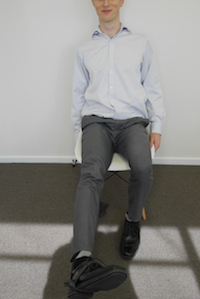 Now transfer your weight forward onto the leading leg while keeping your posture upright. 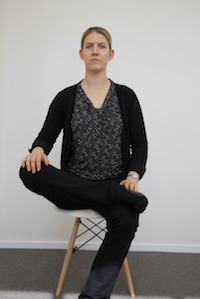 Start seated with leg crossed. Lean forward from the hips without bending at the waist. Laying on your back place your ankle on the opposite knee. 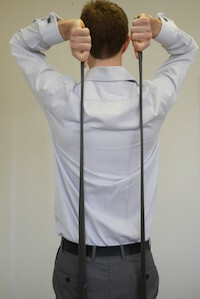 Clasp your hands behind the knee and pull towards your chest. 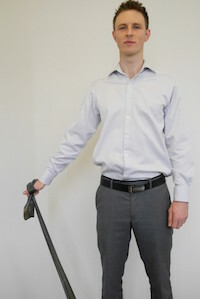 Standing with a split stance grab both handles of an open door. Lean back stretching the arms so that the shoulder blades are pulled forwards. 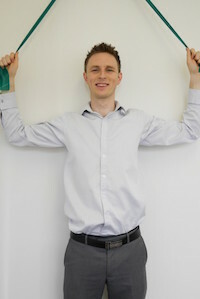 Stand with a split stance with the palms of both hands flat on a wall. Lean against the wall while pushing your heel into the ground. 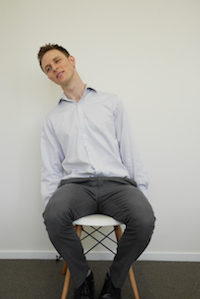 Alternatively, stand with feet level stretching both legs at the same time. 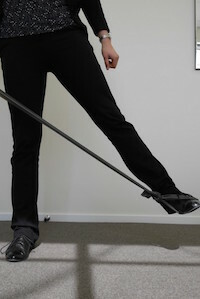 Place the toe up a wall or step with the heel on the ground and lean forward. Sitting with both hands clasping the bottom of your seat. Lean the head to the side. Download a printable spreadsheet of Exercise Descriptions.